NEW DELHI: Wheels within wheels, building connections that make the difference between lack lustre and booming business. So while news focused on Nirav Modi and his relationship by marriage with the Ambani’s, the Rotomac scam of Rs 3695 crores has brought out a Gautam Adani connection, again by marriage to owner Vikram Kothari who is being currently “interrogated” by the Central Bureau of Investigation for the loan default towards a consortium of seven nationalised banks. This came to light when Bank of Baroda rushed to report the ‘fraud’ in the wake of the Punjab National Bank crisis triggered by Nirav Modi. Modi’s brother in a happy coincidence, is married to Mukesh and Anil Ambani’s niece (daughter of their sister) as reported earlier in The Citizen. Bank of Baroda had reportedly classified the Rs 435 crore loan given to Vikram Kothari-run Rotomac Global a “non-performing asset” in October 2015 and a “fraud” in December 2017, but there had been no response until after the Nirav Modi fraud came to light. And of course as it now turns out, Kothari’s daughter is married to Vinod Adani’s son. And Vinod Adani is the brother of well known industrialist and PM Narendra Modi friend Gautam Adani. And as if this is not enough, yet another link has emerged, this time between Jatin Mehta of the Rs 7000cr Winsome Diamond scam fame and Vinod Adani, whose daughter is married to Mehta’s son. Vikram Kothari is from Gujarat originally but his father Mansukhbhai Kothari settled in Kanpur in Uttar Pradesh. And set up a huge pan masala business, with Pan Parag becoming a household name in no time. Vikram set up Rotomac later, with the tag line “ ‘Likhtey, likhtey, love ho jaye” similar to his father’s Bollywood kind of advertising for the pan masala. Fond of cars, like Nirav Modi, Vikram Kothari of an earlier generation was seen as close to then Prime Minister Atal Bihari Vajpayee who gave him a national award, and also placed him on the board of Air India. Kothari has strengthened his Gujarat connections by marrying his daughter into the Adani family. Vinod Adani is Gautam Adani’s elder brother, and was mentioned in the Panama papers. As the Indian Express that was investigating the Panama papers and reported in April 2016 at the time “Months after the formation of the Adani Group’s flagship company Adani Exports Limited — now Adani Enterprises Limited — in 1993, industrialist Gautam Adani’s elder brother Vinod Shantilal Shah Adani set up a company in the Bahamas in January 1994. 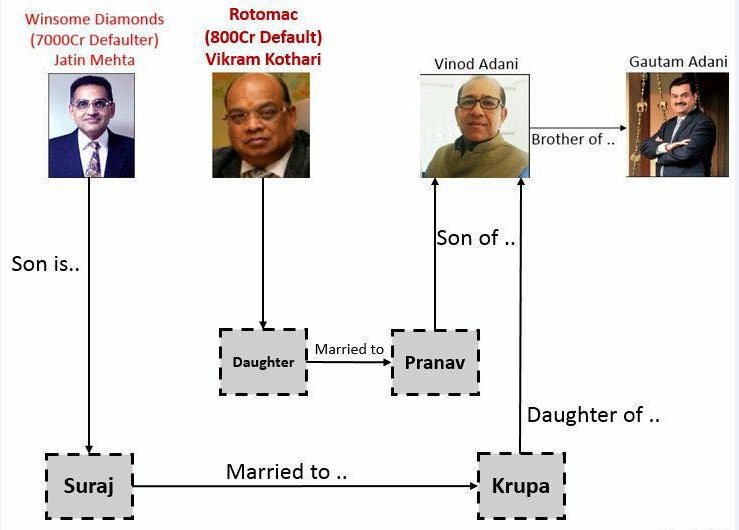 Vinod looks after the Adani Group’s overseas operations and his son Pranav (The Citizen now adds:married to Kothari’s daughter) is a director of Adani Enterprises Limited.Corporate service provider Mossack Fonseca’s records, accessed by The Indian Express, show that GA International Inc was incorporated in the Bahamas by Vinod S Adani on January 4, 1994. Corporate service provider Mossack Fonseca’s records, accessed by The Indian Express, show that GA International Inc was incorporated in the Bahamas by Vinod S Adani on January 4, 1994. Vinod and his wife Ranjanben were its two directors and held equal stake in the company through a bearer share each. Mossack Fonseca was appointed the registered agent. Within two months of incorporation, Mossack Fonseca records show, GA International’s administrator Falcon Management Limited (Isle of Man) wanted to correct “the spelling” of Adani to Shah. In July, 1995, GA International Inc sought to rename itself Agri Exports Limited. But the plan fell through because the proposed name was too similar to an existing international business company (IBC). On April 24, 1996, Ranjanben resigned and Rakesh Shantilal Shah, according to the records, was appointed director in GA International Inc.
Adani Group documents of 2009 show Rakesh S Shah as director in three group companies — Adani Power (Overseas) Limited (UAE), Adani Global FZE (UAE) and Chemoil Adani PTE Limited (Singapore) — along with Vinod S Adani, and one of the promoter group shareholders in Adani Enterprises Limited. According to Mossack Fonseca records, GA International Inc formally resolved on September 23, 1996 that Vinod Shantilal Adani wished to be known as Vinod Shantilal Shah. The records duly corrected all documents, backdating since 1994. In August 26, 1997, Mossack Fonseca received a request from one Fortress Management Ltd (Isle of Man), seeking details of the beneficial owner, directors and shareholders of GA International Inc. The company instructed the firm not to “release any information”. On April 20, 2005, Vinod and Rakesh signed a resolution, replacing Mossack Fonseca with Overseas Management Company (Bahamas) as registered agent. The transfer was completed on July 21, 2005. During its 11-year stint as the registered agent, Mossack Fonseca was asked by GA International Inc to issue Certificates of Incorporation and Good Standing on several occasions. In company records, the address for Vinod, wife Ranjanben and Rakesh was “C/o NR Doshi & Co, PO Box 13742 Deira (Dubai) UAE”. On their website, N R Doshi and Partners describe themselves as “auditors, business consultants and tax advisors”.